Laurier’s diploma in Chamber Music is an opportunity for aspiring musicians to develop their skills. If you’ve completed an undergraduate degree or diploma in music and looking to continue studying the craft, this program is for you. Over the course of two academic terms, you will receive intensive training from our faculty and instructors and be given every opportunity to improve your technical and performance skill. You'll have plenty of chances to perform, as there are numerous performance opportunities on campus and in the Kitchener-Waterloo community. Are you already part of a pre-formed quartet or group? We encourage you to apply together so you can study as an ensemble. Want to learn more about the Faculty of Music at Laurier? Come visit us or request our viewbook. Besides the Penderecki String Quartet, which has been in residence at Laurier since 1991, you'll have the opportunity to work with professionals who are active chamber musicians. Between the informal and formal collaborations within the faculty and the many opportunities available in the vibrant Kitchener-Waterloo community, you’ll have plenty of chances to perform while working towards your diploma. A diploma from Laurier’s Faculty of Music carries with it a highly respected reputation. 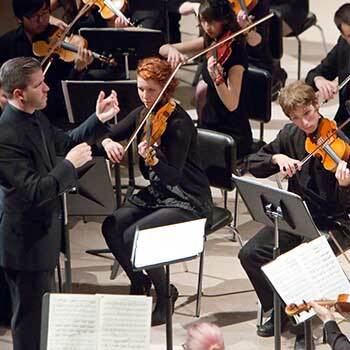 Our graduates can be found in major orchestras and chamber groups in Canada, the United States, and around the world.